The weather forecast calls for a downpour. You have a few errands to run – the grocery store, the bank, and dropping clothes off at the dry cleaner. You look outside and see that the skies are gray and the wind has picked up. Before you leave your house, do you grab an umbrella or do you hope that a stranger on the street will let you borrow theirs if it starts to rain? This may seem like a silly question, and it probably doesn't appear to have much to do with car insurance. However, NOT having adequate Uninsured/Underinsured Motorist (UM/UIM) coverage is like relying on a stranger to give you their umbrella so you don't get drenched. 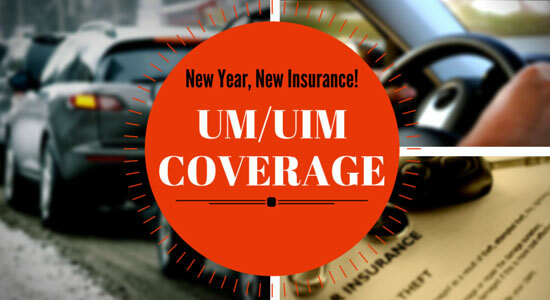 UM/UIM coverage is an optional form of coverage that protects you in the event that you're in an accident with a driver who has no car insurance or not enough car insurance. It's estimated that one in seven drivers doesn't have car insurance even though it's against the law. And far more are underinsured. UM/UIM coverage applies to you and to family members living within your household. It applies if you're hurt as a driver, passenger, pedestrian, or are the victim of a hit-and-run. It can help pay for medical bills, pain and suffering, property damage, and much more. And, it's only a few extra dollars added to your premium. Even minor car accidents can result in damage to your vehicle and injuries that require some form of medical treatment. More serious accidents can mean long-term hospital stays, surgeries, therapy, and more. If you're dealing with a driver who doesn't have any or enough car insurance, you may be the one who is left with the bill for all of this – unless you have adequate UM/UIM coverage. Pennsylvania law states that you must have car insurance, but oftentimes the minimum requirements aren't enough to cover the cost of an ambulance, let alone a hospital stay or medical treatment. Because UM/UIM is an optional form of coverage, there's a good chance you don't have it on your policy. We also encourage you to consider stacking coverage – this is an option that allows you to combine the car insurance policies in your household so you have higher limits to work with if you're in an accident. It only takes a few minutes to review your policy, and you can change your coverage limits at any time. We have a free e-book that outlines the coverage we think gives you the best protection. However, it's too late to adjust your policy after an accident, so make sure you're protected before you need it. Make sure you protect yourself if they don't have insurance and buy uninsured and underinsured motorist coverage. It's the only thing that's going to protect you. One of the only coverages on your policy that actually provides you a benefit and in fact it provides you the best benefit is the uninsured and underinsured motorist coverage. The uninsured and underinsured motorist coverage is that coverage you buy on your policy that pays you when the other person doesn't have enough insurance. Probably 50% of my clients don't have the uninsured and underinsured motorist coverage they have because their agent sold them a quote "cheap policy." Interestingly most clients think that full coverage means they have good coverage. What really full coverage means is that if you wrecked your car the insurance company will pay it for the damage to your car. In reality it's anyone who has a car loan needs full coverage so that their bank will be paid off the amount of the damage. That's all full coverage means. The reason you need uninsured motorist coverage and underinsured motorist coverage is because this is the coverage that actually protects you on your policy. The amount it costs you to buy coverage to protect others who are gonna sue you is far more expensive than the cost of coverage that protects you when someone hits you. In other words the uninsured and underinsured motorist coverage is very inexpensive. If you've been injured in a car accident and have questions, feel free to get in touch with us. We're available 24/7.